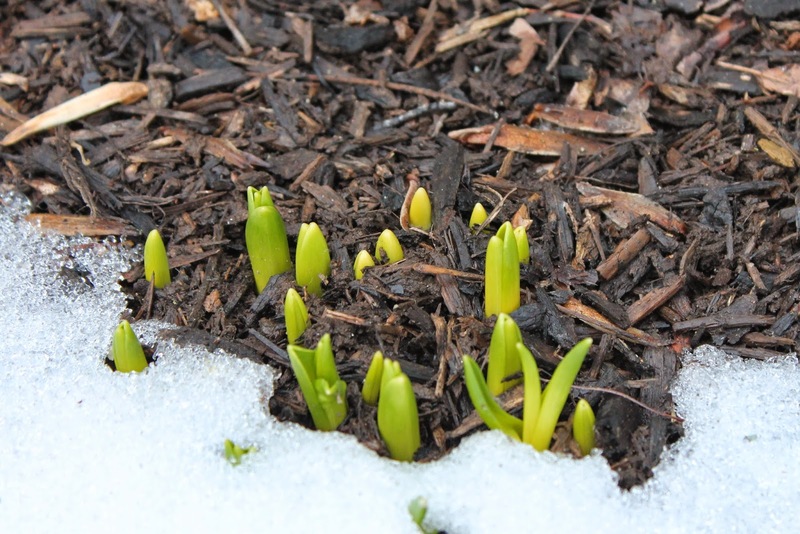 Daffodils are a sure sign of spring, even if there is still snow on the ground! I especially love daffodils in mason jars. And I decided I needed a few cute crates to add a little rustic charm! I already had a huge collection of mason jars and plenty of scrap wood in the garage, so this was a pretty quick and easy project. The first step was to line up five mason jars and take a rough measurement so that the jars would fit comfortably inside the crate. The bottom and side boards were measured first. Mine were 17" long and 3 1/2" wide. Then I just capped the ends. Simple nails put it all together. My completed crate measures 18 1/2" long and 5" wide, but you could make any size you like. I painted my crates, distressed the edges and finished with a two coats of wipe-on poly. I chose poly over wax in this case because I'd be adding jars of water and drips are inevitable. And perfect for a little farmhouse style! These daffodils are from the grocery store. But soon enough I'll be picking daffodils from the garden. I can hardly wait! Hang in there, just one week until spring! Oh I'm so longing for our snow to go but having this sit on my table would make it much more bearable. Great idea and in my house it would stick around for seasonal flowers. these are adorable! they'd be great with clear wine bottles filled with flowers, too! SOOOO cute, Sharon. I love that green color, too. Those are just darling little wooden holders. I love your pictures! My daughter and I went shopping at Home Goods today where they had some boxes, but they were all so long. I couldn't imagine where one would use them. But yours are the perfect size. And the colors, well, don't get me started. So cottagy cute! I think I have wood boxes on the brain; I really want one. P.S. I hope that snow is soon a thing of the past. But just think, without the snow... no daffodils. :) I hope you post photos of them blooming soon in your garden. Hang in there! What a nice bright arrangement it makes, especially with the white snow in the background. this is such a useful project Sharon these can be used in so many ways. You've just given me an idea for my own crate. Also I have to tell you that I'm almost done with Station Eleven. I can't believe you read it in a day. Wow. I had a hard time getting into it but now I can't put it down. I'm taking it with me in the car to get groceries in case I find a spare minute. haha. I have no idea where the author's going right now which makes it a good read. Love them Sharon, perfect spring project. And, no power tools needed, right? Beautiful pictures and what a quick and easy project! Love it! What a cute idea, and my daffodils are just beginning to bloom! Thanks for the inspiration Sharon. They're such a beautiful sign that Spring is just around the corner!